A 25-year-old man with high DHT-sensitivity started losing hair at age 19. He didn’t seek treatment or medication for it, including minoxidil and finasteride, until he was 25 and his pattern hair loss was already quite advanced. 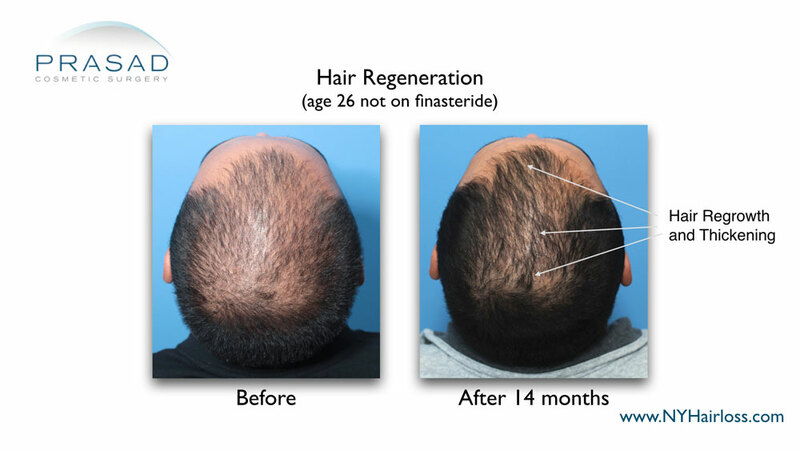 He started with a single Hair Regeneration treatment at age 25. Finasteride is usually prescribed to Hair Regeneration patients at this age range due to high DHT-sensitivity, but it wasn’t taken. Hair Regeneration is not recommended as a finasteride alternative. 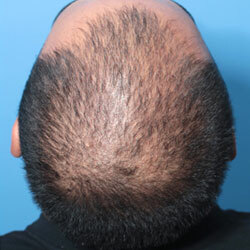 14 months after treatment, at the age of 26, he achieved significantly dense hair growth and thickening atop his scalp. This type of result could not have been achieved with multiple hair transplants as natural hair density is spaced closer together than hair transplants can achieve, and men under 30 lose hair faster than it can be transplanted. A hair transplant with this much thinning hair still present at the scalp would have resulted in permanent collateral loss from the sharp hair implanter damaging nearby native hair. Significant thickening of thinning hair, and growth of dormant hair follicles achieved in one Hair Regeneration treatment without finasteride, although finasteride is recommended for highly DHT-sensitive male patients even with this treatment. Although the results were achieved without finasteride, it is important for most men with early and aggressive pattern hair loss to be on a DHT-blocker along with the Hair Regeneration treatment.